A screening of the film Somewhere In Macedonia, directed by CCW PhD student Alice Evans will take place on 17 December in the Banqueting Hall at Chelsea College of Arts from 5.30pm. During the event there will be two opportunities to view the film at both 6 and 7pm. The narrative film is based on a series of letters sent home to Wales 100 years ago from Macedonia during the First World War. Each letter was headed ‘Somewhere In Macedonia’ to pass censor. 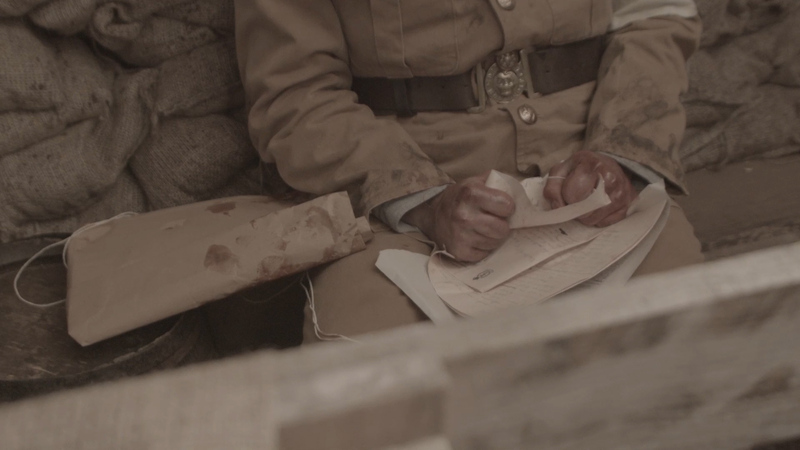 The story introduces us to Idris, a young Welsh war poet and stretcher-bearer as he receives a letter from home. In the events that follow, we see how Idris, surviving under extreme pressure, confined to the trenches of war and repressed by the laws that forbid his sexuality, reacts to news that is to change the course of his life. Based on an archive of real letters, the film aims to show a side of history that would not have been given voice at the time. Director Alice Evans is pursuing a PhD, researching notions of unreliable narration alongside epistolary modes within filmmaking. The film was shot in the basement of a Camden housing co-op where for a week in May- the kitchen was transformed into a WWI trench. Thanks to a talented and generous team, this film could be realized on a low budget. This film is part of a larger feature project now seeking funding for development. Chelsea College of Arts is a screening venue because the Royal Army Medical Corps, of which Idris would have been a member, was based at Chelsea’s Millbank site at the time when the film is set. We are using the Banqueting Hall, as this was the officer’s mess in 1916. Some of the letters that inspired this story were sent from the RAMC at Millbank in 1916 before their author went out to Macedonia. It is appropriate then to screen the film 100 years later on this site. This entry was posted in Events, Students and tagged Alice Evans, Alun Elidyr, Film, Gethin Alderman, Harrison Rose, Iddon Jones, Julian Firth, Millbank, RAMC, Royal Army Medical Corps, Somewhere In Macedonia, trench warfare, Welsh war poet, WWI on December 3, 2015 by Claire. This year’s CCW first year research students exhibition is The Research Hub, a collective that will be held at the Cookhouse Gallery at Chelsea from 23-27 March. There will be a series of events that engages with the multiple facets and diversities that range between the broad subject matters and modes of research as well as The Hydra publication. 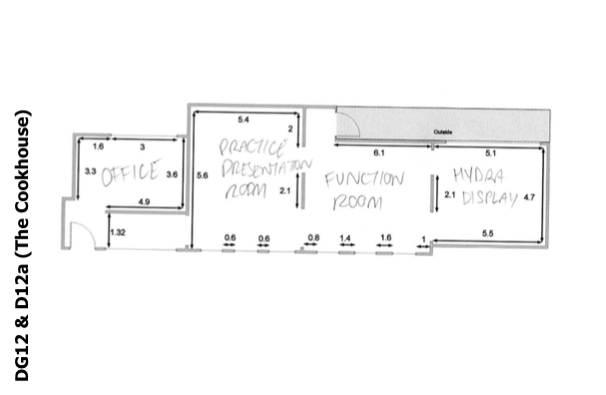 The gallery will be divided into four rooms; the Office, the practice presentation room, the function room and The Hydra display. The cohort has taken inspiration from the original Hydra Magazine published in 1917. The original publication is from the Craiglockhart War Hospital, written by recovering soldiers to keep other patients and the community informed about the happenings around Craiglockhart. In the true nature of research, there will be a draft publication of our version of The Hydra as a printed programme. The programme itself is a work in progress that will be added to and evolve during the week; it will reflect the events and contributions from speakers and other participants. This will be published after the event as the Cohort Hydra, Research Hub documentation. The Office will be occupied by one or more current research students working on their research in situ, whatever form that may take- reading, writing, drawing, etc. The Practice Presentation Room will host experimental work. An event will happen on Tuesday 24 March for which research students have been invited to give short, informal presentations on their work. Sharing the work is part of the research process, an evolution in itself, to ‘practice’ talking about complex ideas that often take the form of art work, film or theory. This opportunity is to build the research community within UAL and to give a platform for people to exchange and discover. The Function Room will host different, led discussion and guest speakers. We hope to create an atmosphere conducive to informal social events that allows conversation to happen. The Hydra itself is known as a mythical beast that had multiple heads. When one head was chopped off another would grow in it’s place. As a group we decided the best way to reflect our research community was to embrace the research process in common themes that effect our individual practices and the chaotic dynamic that happens while investigating a subject, concept or proposed theory. Much like a beast, uncertainty, surprising outcomes, risk and possible failure daunt the unbeaten path of such an undertaking as research. The students organising The Research Hub are Fangyu Cheng, Denise Clarke, Alice Evans, Robert Gadie, Penny Georgiou, Jennifer Murray, Stephanie Spindler, Maria Theodoraki and James Lander and those who wish to remain anonymous. -Monday 23rd – open from 4pm onwards: Opening night drinks reception; Fangyu Cheng and Alice Evans will be giving a practice presentation called ‘Disobedient Objects’; Stephanie Spindler will also be presenting some new work; and the Office of Public Ritual will be performing a ritual. 5pm onwards: UAL Senior Lecturer Dave Beech will be leading a talk. -Wednesday 25th – 6 til 8pm: James Lander will be presenting: SHOWREAL: moving images from the Balfron Tower/Rowlett Street Archives. This event will be hosted in the Lecture Theatre. 3pm onwards: the Riotous Cities group J. Y’Barbo, L. Locke, K. Hye Lee, F. Peschier, M. Namazi, will be hosting a discussion about their Riotous Cities project, and their upcoming Art Riot project. -Friday 27th – Office room and HYDRA room will be open. This entry was posted in Events, Students and tagged Alice Evans, Craiglockhart War Hospital, Denise Clarke, Fangyu Cheng, James Lander, Jennifer Murray, Maria Theodoraki, Penny Georgiou, Robert Gadie, Stephanie Spindler, The Hydra, those who wish to remain anonymous on March 12, 2015 by Claire.